Just a note to let you know that tonight I will be Scott Terry's guest on Christian Farm and Homestead Radio. The link will take you to the live show, starting at 8 p.m. Eastern, or you can download the podcast at a later date. We'll be catching up on homestead activities and discussing Critter Tales. Now that Critter Tales is behind me, I'm turning my hand to working on more volumes for my The Little Series of Homestead How-Tos eBook series. Yes, I know that sounds like it contradicts my New Year goal of going hard-copy for information I don't want to lose. From a writers' perspective, however, eBooks (like my blog) give me a chance to get something published, get feedback, and edit them later. My eventual goal (Good Lord willing and the creeks don't rise) is to compile the series into a paperback. 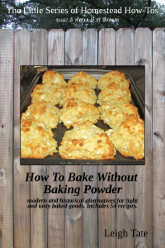 The one I'm working on at present is "How To Bake Without Baking Powder." When we think of baking without commercial baking powder, recipes for homemade baking powder come to mind. So do old-fashioned recipes calling for saleratus and sour milk or buttermilk. All of these work on the same chemical principle: an acid + a base = carbon dioxide bubbles which cause a batter to rise. While doing my research, I ran across an interesting statement in a Wikipedia article. "In times past, when chemically manufactured baking soda was not available, "ash water" was used instead. Ashes from hardwood trees contain carbonates and bicarbonate salts, which can be extracted with water. This approach became obsolete with the availability of purified baking soda." How could I not resist following up on that? I know ashes in one's food probably sounds gross, but consider that wood ashes have been used historically in cooking worldwide: in Mexico for nixtamalization of corn for masa, in the Philippines as Lihia, in Nigerian cuisine as Kaun or Akaun (Cooking Potash), in traditional Scandinavian foods like lutefisk (lye fish), for making olives in the Mediterranean, in old European recipes for Greek and Polish cookies, as Pottasche for browning German pretzels and lye rolls, in gingerbread, in Chinese Century eggs and noodles. Native Americans also used wood ash to make hominy. Cooking with ash is considered a trendy gourmet technique, and think of ash-coated cheeses. Or how about this paleo recipe for steak cooked on a coal bed? All of that might not convince you, but the prepper in me is always running in the background asking, "How would I do that if I couldn't buy or barter for it?" In this case, "How would I bake quickbreads if I couldn't get baking soda? Could I somehow use hardwood ashes if I had to?" There were no references for that tidbit at Wikipedia, so I had to do a little digging on my own. In his blog post "Where does soda bread come from?," Joe Pastry mentions that Native Americans used ashes to "lighten" their grain cakes. Susan Slack ("Pearl Ash – A forerunner to Baking Soda") further states that the Hopi made a thin batter of blue corn meal, wood ash, and water to make piki, their staple bread. In terms of actual recipes, the earliest references I could find did not call for wood ash proper, but rather for potash. Potash is a product which is refined from hardwood ash. It was in use in American cookery in the 1700s. Example proportions are found in an old "American Potash Cakes" recipe in The Domestic Encyclopedia, Or, A Dictionary Of Facts And Useful Knowledge, Chiefly Applicable To Rural & Domestic Economy: With An Appendix, ... And The Veterinary And Culinary Arts... (published in 1802): a half-teaspoon potash dissolved in a half-teacupful of water to 1 pound flour (about 4 cups) and a quarter pound of butter (1/2 cup). In Martha Washington's Booke of Cookery and Booke of Sweetmeats, transcriber Karen Hess states, "that American women were routinely using this chemical (made at home of wood ash) in their baking," (page 201). She is referring to pearl ash (or pearlash), but gives no clue as to how it was made at home. Pearlash (potassium carbonate) is a purified form of potash. It is sometimes found in recipes of the American Civil War era and before. The modern leavener of the time, however, was saleratus (Latin for aerated salt). Chemists had discovered that by exposing potassium carbonate (pearlash) to carbon dioxide gas, they could make potassium bicarbonate. It was twice as potent as pearlash, with one teaspoon of saleratus being equivalent to 1-1/4 teaspoons of baking soda. In the mid-1800s a purer form came onto the market - sodium bicarbonate. Originally developed in Europe, the first American manufacturers of sodium bicarbonate also called it saleratus. Later it became known as baking soda. interesting. looking forward to the experiments. I have read articles on making lye with wood ashes and water for use in soap making. Countryside Magazine always is an interesting if not scientific source of old school knowledge. Isn't it sad that there is little written documentation of the marvelous things women did in the home because they were "women". I guess we will just have to try to channel it up from the meager descriptions that there are! So true. So much information almost lost. One thing I'm realizing, is the tendency to apply modern meanings to old terms and concepts. "Lye" for example. Ash water is also referred to as lye water. My modern idea of lye is sodium hydroxide, a substance so dangerous that I can't buy it locally any more (which makes it difficult to make soap). Wood ash water (potash) contains the weaker potassium hydroxide (not recommended for making hard soaps but useful for soft soaps) which is, of course, diluted by the water. What I'm trying to say is that I see the terms and make assumptions, but by digging deeper I'm learning a lot of interesting stuff. Very interesting information, Leigh. I appreciate reading how you contemplate and figure things out. I definitely look forward to part two. I found this site, Leigh. Caveman Chemist Very interesting. Hubby's family is German and likes to make pretzels the old way... not so old as to use wood ash though...they used Lye. But finding it is hard. My MIL told of how she had to lie to the hardware store to purchase lye because it became a controlled substance. I still have a small jar with a bit in it, but I've been using baking soda for our pretzels...miss the flavor though. Oh, very interesting! I can't wait to see how this turns out. I would much rather eat any baked good made from hardwood ashes than any box of Kraft Macaroni and Cheese or the like! Renee, it's not a controlled substance, they just don't want to sell it. :o Go online and look at soap making supply sites. You can get it there. I remember mama talking about her mother using wood ashes to make hominy and also lye soap. You are so smart. Wish I had the patience to read and learn about these things. Again, can't wait to learn from your experiments! Maybe not so much smart as curious. :) Don't you wish someone had written down how she did it? Family treasures. I just hope they're helpful! I'm intrigued also! Very curious to see how your cooking turns out. I found this old book to have an interesting description of the preparation chemistry, if you're interested. Oh! I should have read through that one more time before posting--I didn't mean to imply that your research is "first-page-google-results," far from it! This blog is one of the best-researched ones out there. I meant that when I was searching for pearl ash myself, most of the top results didn't seem to get the chemistry quite right. Sorry for any offense! The first baking powder is said to have been invented in 1843, although it took a few years to come into a wide popularity. Rumford Baking Powder dates back to 1869. Interesting stuff, isn't it? Hi Jake! Firstly, thanks for the book link. It's one I hadn't seen yet. I've found quite a few really useful books on Google Books to help in my research. Secondly, thanks for the nerdy notes. :) That pretty much confirms what I postulate in "Part 2," scheduled to be published next Wednesday. Also, I did not take your comment about research personally, so no worries there. :) I've spent hours and hours (days > weeks) digging into this fascinating subject and have collected quite a list of resources (which I'll put in the eBook). It's hard to sort out what to include in a blog post, and is why this blog series will probably be 3 parts! I have read that corncob ash was also used- http://glory-farm.blogspot.com/2015/01/corn-cob-soda.html . I still haven't tried it. It'll be interesting to see how your experiment turns out. I am anxious to see/read your results! Following!!! Charlotte, thank you! I've got written instructions, but seeing someone do it is really helpful. Seems like a big process, so I'm not sure if I'll ever actually do it. But it's good to have the info, because who knows? Odiie, thank you! Another little gem of information. I'm doing some internet searching and after we shell our corn I'll give this a try. We often get some of those red cobs. I am reminded that in Anne of Green Gables books (c.1870-1910-ish) the "Rollings Reliable Baking Powder" was a new product advertising to Canadian housewives. I've run across perlash as an ingredient in dyes as well, changing the acid/base levels can change the colour of several natural dyes. I will be interested to see how your baking turns out. I'm planning to have a baking day soon!